Posts with tag: "product review"
To the point, great case. It's very sturdy and can hold 12 SD cards. The only downside is that the cutouts that hold each card in are identical to an upward facing card. Whenever I am on a job or finish uploading a cards data on a backup storage, I always flip used or full cards over so at a glance I can see what cards are empty. This case does not allow that. It's somewhat minor thing and I hate having to change my habits to fit it but it is what is especially when it comes to saving money. 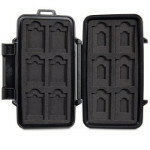 I will probably buy a second just to hold used cards but I can purchase two of these cases for the price of one Pelican 0915 case. I can even just use my pelican case to flip the used or full cards over. Also another thing I don't like is the case inserts. It's a hard plastic and being a person with low nails, I would have to use a quarter or so to remove the card. Also with that, no vibration reduction so I am guessing if you drop this case at a distance, bye bye to your card(s) and data. To the point, this is a great case. I've had this for a few months and it's great...very sturdy holding twelve SD/SDHC/SDXC cards in a convenient layout so that you can see which card you need. Lift one of the SD cards and you'll find additional space underneath for six miniSD cards on one side and and six microSD cards on the other. It has a grey closed cell foam insert liner that's designed to absorb shock and protect the memory cards, and it has a sturdy water-resistant polycarbonate housing with a water resistant seal. The case uses a metal pin for the hinge and a 2" wide reach-over clip to latch the case closed. For the price, it's a good investment for a high end case. 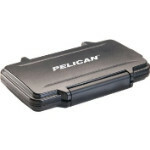 Overall with Pelican 12 SD card case, you get to storage of 6/6 other cards. 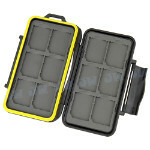 Overall, if you are looking to store just SD cards and on a budget, JJC MC SD12 is the way to go. If you are looking for a case with a reputation, warranty, and additional storage for other type of cards, the Pelican 0915 is the way to go. I have both case because I found out about the JJC MC SD12 at a later period because it's a product made in China and sold mainly on Ebay and marketed in the US. Personally, I just need a secure case for my SD storage and safe travel. Both cases does the job. Besides make, model, and manufacturing, it's the same product to an extent. You have to know what you will need but just know both case are a great investment. Update as of 2014-12-13: JJC MC SD12 is annoying. Because of the hard interior, it hard to remove the memory card when seated at the same time, it is hard to seat at times. Everytime I seat my memory case, I have to press on around the edges of the card to make sure it doesn't fall out. I don't have that problem with the Pelican 12 SD. The final problem I have with both cases is the Water-Resistant feature. It is not made with the case so it can easily peel off. There is no glue of any kind holding it in place. Maybe I am overthinking it. Being able the flip your SD card backwards have been a big thing for me so getting used to the design of the JJC MC SD12 is not going to happen. My advice...stick to the pelican case. I might end up purchasing another Pelican case.